My fall baking moods seem to take on themes during certain months. Once September hits, I feel like I need to eat and bake with as many apples as possible. Even though they’re available throughout the fall and winter months, I feel a surge in September. It starts to wane towards the end of the month, and then October hits. For me, October is the month of the pumpkin. I know that Thanksgiving is typical pumpkin pie day, but by then I’m already full-on excited and planning for Christmas, so my pumpkin lust starts early. Plus, October gives us Halloween (pumpkin carving and pumpkin seed roasting!) and, more importantly, it gives us “It’s the Great Pumpkin, Charlie Brown”. I’m a sucker for holiday programming and feel very strongly that I should be baking (or, at the very least, eating) something seasonal during every Charlie Brown special or any of the following: Rudolph (the old school one, with the Land of Misfit Toys), Christmas Vacation, Elf or A Christmas Story. 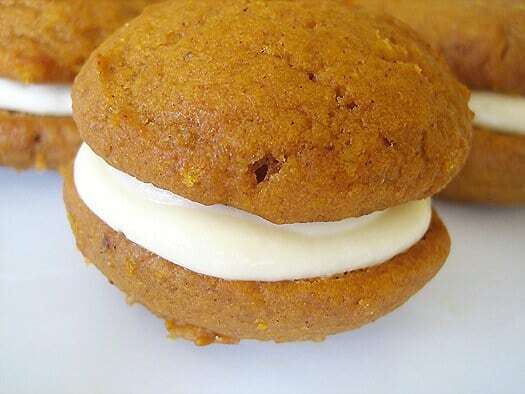 Well, October is only a couple of days away so let’s get moving with these whoopie pies! You may remember me talking about the whoopie pies vs. gobs nomenclature conundrum when I gabbed about s’mores whoopie pies over the summer, but I’ll lay it out there again. It’s weird for me to call these whoopie pies; I grew up calling all cookies of this type ‘gobs’. It’s regional. It’s Pittsburgh. But I also realize it’s a minority. So no matter what you call these, let’s be clear: you need to make and eat these! To celebrate October, of course. And the pumpkins. And Charlie Brown. The cookie-cakes themselves are soft and light and absolutely packed with spicy, seasonal flavors. Your house will smell like Thanksgiving while these are baking. And paired with a maple cream cheese filling? Heaven. 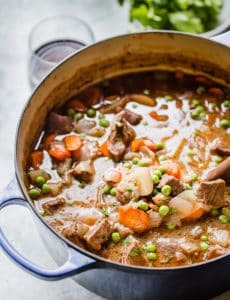 An old colleague of mine shared this recipe with me years ago and I’ve been enjoying them ever since. They should become part of your fall baking rotation too! Next Post » Happy October! Celebrate with 10 Amazing Pumpkin Recipes! Had to bake the cookies 20 minutes or more for them to set up. Mine are sticky, as the other reviews mentioned. I used a cookie scoop and they do not spread. I checked my oven temp and it was 350, also baked another kind of cookie and it baked in the time suggested. Sorry, for the trouble I had I will not bake them again. This recipe was amazing! I made it twice in one week & everyone raves about it. The only thing I changed is that I swapped out 2 sticks of softened butter for 1 cup oil. I couldn’t see making this with that much oil in it. Came out perfect. Thank you! I have seen similar recipe elsewhere that only calls for 1.5 cups of pumpkin. Would 3 cups make it too runny? Hi Jen, I’ve never found these to be too runny! 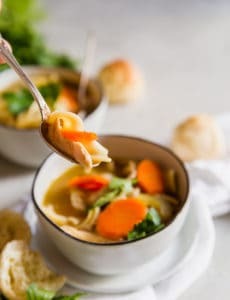 I’ve made this recipe before and LOVE it! I am hoping to make it for a bake sale fundraiser. I would need to bake the whoopie pies 6 days ahead of time to work w my schedule. Do you think they would stay in the fridge for that amount of time? I’m worried the freezer might ruins the cream cheese frosting but maybe not. Thanks for all of your delicious recipes! Hi Aly, I’m so thrilled to hear that! I would freeze the whoopie pie cookies and then make the filling and assemble the day before you need them for the freshest dessert! I see the recipe calls for chilled pumpkin. Does it have to be chilled? Hi Brooke, I think it would still work okay if it were at room temperature. Of note – I’m a Mainer that’s big on whoopies!!! When I found this recipe the other day I thought they would make a great bake sale item at my son’s school fundraiser. I’ve never made whoopie pies before but remember buying ones like these years ago in Maine. I sampled one before sending them off, and they are FABULOUS. Moist, lots of flavor, wonderful filling. I’ll have to make them again just for my family. 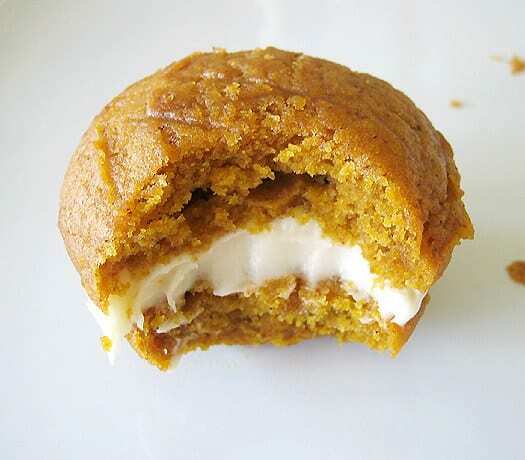 I made these Pumpkin Whoopi Pies With Cream Cheese Maple Filling They are DELICIOUS! WOW . Instead of canned pumpkin. I made my own pumpkin puree. What a better puree. Very easy to make. If anyone isinterested in making your own puree. Please email me. THESE LOOK AMAZING!!! I am so pinning this recipe, it looks great! I also signed up for your newsletter all of your recipes look fantastic. I made these for an early Thanksgiving theme potluck and they were a hit. I followed the recipe exactly and they turned out perfectly. I didn’t have any issue with the frosting being soupy, but I did use my stand mixer so maybe that helped thicken it. This yielded only about 2 dozen assembled pies for me, but I may have made them a little on the bigger size. This is a great recipe, and will definitely make again. I made these over the wknd. I had to experiment with the filling because I could taste too much of the vanilla extract. I put in a 1/4 cup of milk and more maple syrup than the recipe called for and it took the strong vanilla taste away. I couldn’t taste the maple at first so I added until I could get a hint of maple flavor. 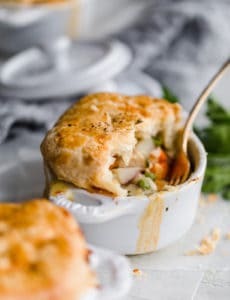 You do need to chill these pies for the center does get soupy if left out too long. The pies were delicious. They came out perfectly done! I cooked them for 12 mins. I may add some choc. Chips in my next batch. My friend from Uniontown, PA brought t a huge batch for Thanksgiving. Everyone raved about them. I had never heard of them, or cookies called ‘gobs’, and I am from Pittsburgh too! We must be from different neighborhoods. This is the perfect recipe to duplicate what he brought. I followed the recipe exactly and they turned out perfect. Thank you! These are yummy and lots of fun to make. I used a muffin top pan to make them, so anyone else who tries this (I think they are also intended for Whoopie Pies) they come out pretty big. I tinkered around and was able to make smaller ones with less batter, but just something to keep in mind. 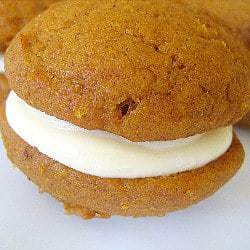 Whoopie Pies were one of my favorite treats in high school. So I always have a soft spot when I see a recipe. I made these using a muffin tin that only makes muffin tops. Not sure if that was a good idea. They came out huge! Beautiful, perfect actually, but huge! I scaled the next batch down some and that was reasonable. Anywho, taste is super yummy, and they were a lot of fun to make:) thank you! I made these a few times last fall and they were a hit! I made them for a bake sale that my son’s marching band hosted, and these sold oout in a matter of minutes! My daughter asked to day if we could make them, so later tonight we will make our first batch of the season. A friend of our said that they satisfy a sweet craving without being over sweet. That pretty much sums it up! Thanks for sharing the recipe!! I’m making these as a wedding favor for my son’s wedding and would like to make them ahead of time. Any suggestions on thaw time if I freeze them and how long are they ok out of the fridge? Hi Jenny, I am not sure how long they would take to thaw, but they should be fine at room temperature for a day (take them out in the morning, serve until evening). Hello! What a yummy recipe! I finally made these tonight and when the cakes cooled they seemed to look deflated. Wondering if I did something wrong or if this is normal. From your photo, I was expecting them to be fuller but mine look more the height of a cooke than a petite cake. I did not have a small scoop though so wondering if that is what makes the difference in height. I hope when sandwiched with frosting that the height will not matter but curious about what they look like before assembly in case I’ve made a mistake. Thank you! Hi Helen, Using a larger portion of batter definitely could have contributed to this.